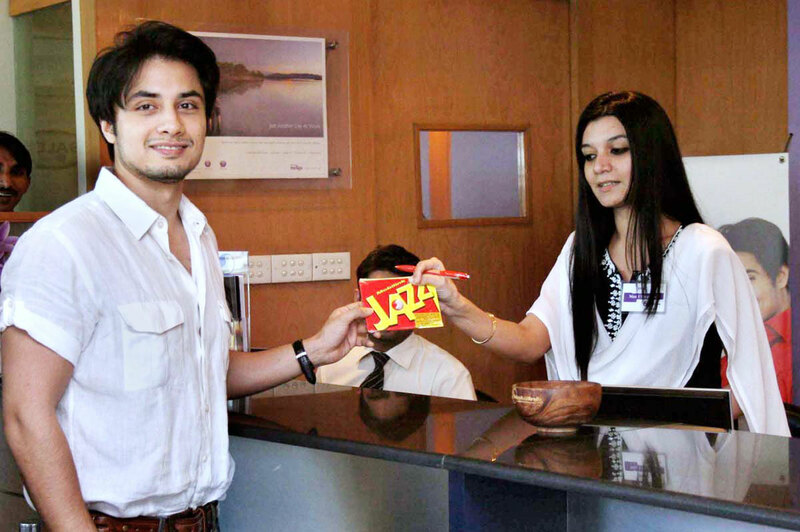 Ali Zafar, the latest entry in the Mobilink Jazz Family, is seen getting his “Jazz On” at a Mobilink Contact Centre. The superstar created a stir amongst the customers present as he reactivated his Jazz SIM to once again become a part of Pakistan’s largest cellular family. Ali Zafar was Telenor TalkShawk’s Brand ambassador for past three years, before his contract expired last month. There went a huge discussion on this move by Mobilink to get Ali Zafar on board. Read here our yesterday’s post for more details on this. this is called competitor attacking strategy…. This is really a great news.A guy like Ali Zafar getting into jaaz family is really surprising.Anyway’s watch out for him.He will surely rock. Every person wants a good status in life day by day as ali has done. Dear don’t use word ‘LOTA’ that was contract which expired. as HR it is hire and fire policy. there is a marketing/media agnecy level change in Telenor and looks like they havn’t treated ali zafar well so he moved. whats the big deal. telenor or mobilink has not bought ali zafar for life. it is a relationship between company and the icon that keeps it live. paisy key liye..etc are immature comments. What impact it’ll create on the consumers?? That’s the question, will they consider to switch from telenor to Mobilink after him ?? exactly…. there must be some problem with tawlshawk…that is y…Aj se Jazz on hai…. ‘Wise’ Ali Zafar has given a message to ambassadors of other brands. Mobilink is the MARKET leader and everyone loves to the part of it……..
and everyone tries to be at best place this what Ali Zafar has done………..
Ali zafar suits with telenor, lets see whats new he bring with mobilink over the media. u hve done a nice job ALi…its ur right..and we also need a change …har waqt tou talkshak acha nahi lagta…waisay ad Alaaaa banae hay jazz nay..
Ok here’s the inside story. Telenor delayed Ali’s payments for way too long and breached the contract. plus the new team was not professional at all with dealing and rude to his manager,so Ali said tata guys. It has always been that big companies use stars, think that they have bought them with their money and then throw them around.But they don’t know that there is a difference between a true artist and a bikaoo artist. this is the first time an artist stood up for his rights and pricipals and fought em over . way to go ali z !!! Well this is a good news for mobilink but bad for ali zafar future! Ali Zafar! congritulations, may Allah shower his blessings on you. Don’t forget an assigned duty to each citizen from the time he steps in teenage is that he is ambassader of his country and that too without any payment, rather he always pay for it, if he is a good citizen. Moral: Dont trust Ali Zafar, tomorrow if zong gives him some more he will switch to zong. Ppl business is business but there shud also be some individual identity or others will definitely say that look there goes the LOTA. Ironically true dude. Why u guys waisting your time for ALI ZAFAR. Its his own life.He is an actor.And he will go there, where he make more money. Every one has an equal right to take a better opportunity provided it goes by the contract. I was also bit surprised to see Ali in Jazz Advertisement but i hope that this new development will create a healthy competition and collaboration. Telenor is full of creative thinkers and winners so no issues. 3. why cant they entertain there brand embassoder so they could not effect on their repute. 2. instead of adding new actors, improve Services and rates which will increase its membership rapidly, as no doubt its wide cellular network but only those ppl are still using mobilink who are using it from that time when Mobilink was the only GSM company. younger Lot is not preffering mobilink because of its Terrif, rates and Ghum-Chakkar kind of offers. he might loose some of his Fan following by doing such act, if he would join Mobilink 6 months later ppl may forget that he had ever be in TeleNor. well all the above arguments are worth reading with many of the opposite gender taking side of the handsome Ali, well it is true too cause he is undoubtedly a heart throb. Nazish wrote best comments on it……. First about moral value: when you are doing a job and you are enjoying a lot, suddenly after 2 to 3 months you get the chance to serve a better company with some good packages and i am 100% sure 95% of us will go for that. So please dont say that its immoral because its Ali Zafar’s job. “Oh and ofcourse the shift in brand. The blues and the Jazz ! Well i could assume that people would be shocked and confused and contrive various stories as to how and why it happened . Well hear it from the horses mouth. I had worked for telenor with dedication and sincerity that even they would vouch for and we shared a mutually benificial relationship for 3 years. But recently my last contract expired with them and i was offered a new one from Mobilink . Simple ! it is not just telenor’s fault, the industry in pakistan has evolved very recently, and until a couple of years ago, using brand ambassadors was not the norm. in more mature markets companies sign a non-competitive agreement with their brand ambassadors so that they cannot work with the competition for a certain amount of time after the initial contract expires! Well. Ali Zafar has very conveniently avoided the part in his blog about the blunders that telenor made . He seems to have chosen a path of humbless and harmony , whereas the true story is that he was not treated upto the mark by telenor . A company who hires the brand ambassador needs to know how to treat one. It can’t be a one sided relationship . As per my knowledge it wasn’t the money that pushed him away from telenor but actually telenor’s mismanagement, delayes in payments etc . Apparently telenor still owes him money . So if you’re talking about loyalty , then it cann’t just be from the artist’s side , has to be from the brand too . Hope Mobilink doesn’t do the same . hehehehe mobilink ka ho gaya yeh …. instead of adding new actors, improve Services and rates which will increase its membership rapidly, as no doubt its wide cellular network but only those ppl are still using mobilink who are using it from that time when Mobilink was the only GSM company. younger Lot is not preffering mobilink because of its Terrif, rates and Ghum-Chakkar kind of offers. hayyyyyyyyyyyyyyyyy aliiiiiiiiiiiiiiiii hope uuu rr fine i am ur very big fan plzzzzzzzzzzzz apni new album jaldiiiiiiiiiiiiii se on kar dain warna hum aa kar kar dain.